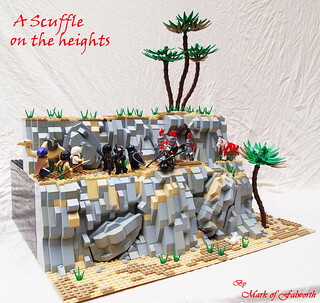 Classic-Castle.com • View topic - LCC-Loreos A Scuffle on the heights. LCC-Loreos A Scuffle on the heights. Mark of Falworth was traveling through the desert one day when all of a sudden, He heard yelling nearby, Hastening to see what was causing the commotion Mark found that a small group of peasants was being attacked by a group of fiendish outlaws! Mark and his companions wasted no time in defeating the outlaws who were so intent upon their prey they did not realize they were in danger until it was too late. Re: LCC-Loreos A Scuffle on the heights. Very nice action in this scene. Your rock and cliff work is really amazing Mark, I think we can start calling you also "the rock master"